DLS classes of 40 minute duration are offered as a whole class activity for all the children from UKG to Grade III in the mainstream. In addition to the above, training in yoga, brain gym exercises and Physical Education is imparted by professionals, to improve the attention span of students. 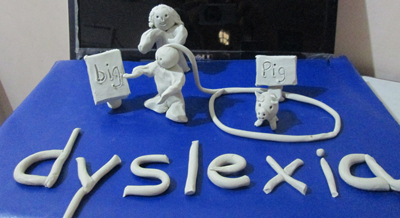 Plasticine clay is provided to the children to help them learn concepts using multi-sensory approach. Children are encouraged and assisted to identify their strengths. Children are taught to use these strengths for better understanding of concepts. Audio and Visual resources are extensively used for teaching concepts. Children are provided personalized professional attention. These are an innovative set of self-regulation skills, which provide students with the self-directed ability to be focused on the learning task at hand. Release – Breathing exercises to stay calm. Energy dial – To understand and independently regulate the body energy level depending upon the task at hand. Focus – Body alignment tool that helps the child to be present both in body and mind. 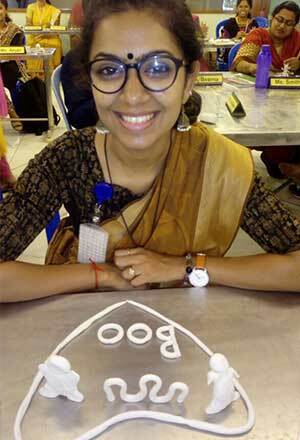 Alphabet mastery – Both the upper-case and lower-case letters are mastered using clay. Every child takes ownership of the letters created by him. Trigger word mastery with clay – A list of 250 words commonly known as the sight words are mastered in this process. Mastery of these words helps the child to improve his grammar and prevents disorientation. Sweep, sweep spell – To read new/difficult words without causing any stress to the child. Dictionary mastery – The children are guided systematically to handle dictionary. This helps them to develop vocabulary and makes them independent readers. Picture at punctuation – The child is asked to picture the sentence that he has read each time he completes a sentence. Visualization techniques – This helps the child to learn spellings along with the meaning of the word. Improves the child’s muscle tone (fine motor muscle), as clay is used on daily basis. Helps to perceive letters accurately. Removes triggers in letters/sight words. Helps to correct spelling mistakes. Improves vocabulary and comprehension skills. Helps to improve creative writing skills. Concepts in Math, Science and Social Studies are mastered using clay. The child creates a model of the concept taught. This helps the teacher to understand the accuracy of his perception. The child masters the concept for life as the concept is taught using tactile, kinaesthetic and visual intelligence. Davis Dyslexia Correction Program and Davis Learning Strategies were created by Ronald D. Davis, author of The Gift of Dyslexia and founder of Davis Dyslexia Association International, Burlingame, CA, USA. Davis Learning Strategies program helps in preventing learning difficulties in children. It gives unique strategies for providing very effective reading instructions and gives the students lifelong skills in the art of learning. Research in this area has proved that implementation of DLS benefits all students, no matter what their learning styles or reading levels. Sharon Pfeiffer, a teacher with more than 20 years of classroom experience, supervised research and development in this area. She conducted pilot programs in several local San Francisco Bay Area classrooms from 1994-1999. Reach all students regardless of their learning style. Build sight vocabulary, comprehension, and other reading skills in the child. Trained facilitators – All the facilitators handling Indigo sections are Special Educators and have been trained in Davis Learning Strategies. Low Student-Teacher ratio – Total number of students in a class never exceed 20. Extra caretakers are provided for Classes I, II and III. Curriculum taught using Davis Learning Strategies – Teachers handling Indigo sections use Davis Learning Strategies in the class room. 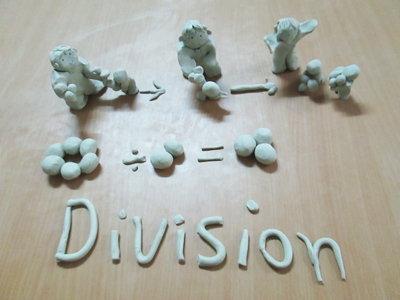 Concepts in different subjects are mastered using clay. All the material required for conducting DLS classes is imported from UK. 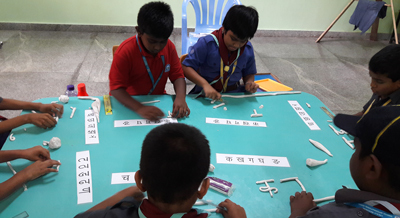 Multiple Intelligence Methods of teaching – It is ensured that concepts in all the subjects are taught using multiple intelligence methods like visual, kinaesthetic, tactile and auditory. The focus is on mastery of concepts and not on rote memorization. Brain Gym Exercise – Trained Edu-Sports teachers frame a need based specific curriculum for each child. Every morning the children are guided into doing brain gym exercise to enhance their potential. 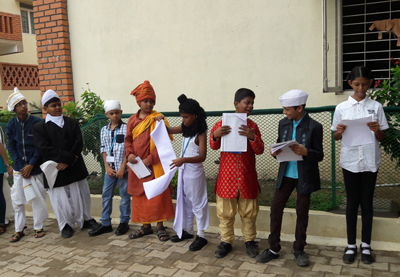 Emphasis on extra-curricular activities – The children are encouraged to participate in activities like drama, dance, art, music, sports etc. They are trained and provided opportunities to anchor programs and make presentation. A lot of emphasis is laid on training them in life skills. Montessori Room – All the children from Grades I to VII are guided by Ms. Jacqueline a highly experienced Montessori teacher and trainer from France in the use of Montessori techniques to learn concepts and life skills. Individual counselling for the child and parents – One on one counselling is provided by qualified professionals in case the child is found to have behavioural and/or emotional issues. Basic Skills Assessments – Basic skills assessments are administered to each child at the beginning, middle and end of the academic year. The assessments are conducted by trained special educators in reading, comprehension, vocabulary, creative writing and other basic skills of the child in English and Mathematics. Standardized graded material is used for these assessments, which help us to determine the Independent level/ Instruction level and Frustration level of the child in reading, writing, comprehension and Math. Individualised Education Plan – on the basis of Basic skills assessment, an Individualised Education Plan is designed for each child. The IEP is designed to help the child overcome his conceptual and basic skills gaps. The parents are individually briefed about the IEP of their ward. Counselling & guiding parents / private tutors – Parents and/or private tutors handling the child at home are called for counselling sessions and are briefed about the needs and strengths of the child. They are also made aware of the child’s learning style and what works best for him/her. Interested parents are also made aware of the instruction material that could be used by them at home. The child remains in the Indigo Section till he/she acquires age/grade appropriate academic and social skill or Grade VII, whichever is earlier. When the child is able to handle the load at any particular grade level successfully, the child is transferred out of the Indigo Section to the mainstream at that grade level. The child is monitored closely by the Counselor and Class Teacher for a period of time to ensure that the child is comfortable. Children who remain in Indigo section till Class VII due to the severity of their difficulty are shifted back into the main stream in Class VIII. The parents are updated about their child?s needs and are requested to consider signing up their child for NIOS, the Open Schooling system (available in Lalaji Memorial Omega International School, for students aged 14 and above), since it is likely that the child will not be able to manage the demands of the traditional CBSE curriculum.